RUSH: Look at this. TheHill.com: “Americans Brimming with Optimism on the Economy.” I saw the headline, I must tell you, even I, El Rushbo, just to show you how hard this is, even I was surprised. Because, look, we can’t escape the past month of media coverage. And one of the efforts the media’s been engaging in, is trying to present a picture of Americans unhappy they elected Trump. Unhappy they voted for Trump, now pulling their hair out, “Oh, no, what do we do now?” And that’s not an accurate picture of America. It’s a picture of the protests that we’ve been shown, but it’s not a picture of America. America is actually pretty optimistic. Trump’s supporters are as avidly for him as they have always been. That is such a stark contrast to even back in October/November when it was 73% thought we were on the wrong track with Obama. That means a lot of this optimism anticipates the Trump agenda. And, again, it is why I continue to urge the Trump administration to get going on it. I mean, look, it’s all fine and dandy to stop the TPP. It’s all fine and dandy to say you’re gonna continue to, say, do NAFTA. And it’s all fine and dandy to keep talking about the wall. That’s crucial. Immigration is. But, man, repealing Obamacare? And look at the differing… There’s a story that ran yesterday. It’s on Drudge. Let me find it. We’ll get it exactly. Trump echoes it. Rand Paul comes out, “Damn right, we’re gonna get rid of this as quick as we can.” So what’s the truth? Well, where are these stories coming from that the prospects for repealing Obamacare are just dwindling away rapidly? Let me just… I haven’t done this yet. But let me click on the link here. Let’s see just exactly where this takes us. Ha-ha. It’s the Washington Post. RUSH: Yeah, Mark Penn ran Hillary Clinton’s campaign for president in 2008. He was also her pollster. And guess what? She still owes him money. Hillary Clinton still owes Mark Penn money all the way back 2008. He was chief strategerist for her in her 2008 presidential campaign. I don’t know that he worked on this last campaign because she still hasn’t paid him from 2008 (when she lost, of course, to Barack Hussein O). Here’s another story, ladies and gentlemen. I told you there’s a little, tiny stack that’s starting to develop that’s showing cracks in the so-called resistance to El Trumpo, and it’s again from TheHill.com.com. And it’s a poll, from the same poll, the Harvard-Harris poll that shows optimism on the economy. Get this: “Americans Want Democrats to Work with Trump — A strong majority of Americans say Democrats should look to cooperate with President Trump to strike deals, according to the inaugural Harvard-Harris poll provided exclusively by The Hill. The survey found that 73% of voters want to see Democrats work with the president, against only 27% who said Democrats should resist Trump’s every move.” Again, this is Mark Penn, a Hillary campaign pollster and operative (that she hasn’t paid). That 73% number is almost the exact number of people who thought the country was headed in the wrong direction in the last months of the Barack Hussein O Regime. Now, this is striking. Once again, by the way, the streets of American cities just magically happen to have a bunch of Trump protesters out there today. Just magically! I mean, they’re just out there, and the pictures are from helicopters and it’s made to look like tens of thousands of Americans are out protesting Donald Trump over the supposed latest Trump outrage, whatever it might be. And again, vast majority of this stuff is bought and paid for by — it’s not a cliche to say it; it sounds it. It’s George Soros and I’m sure Obama and his Organizing for Action, which is an uptake on organizing for. Obama has a community organizing group, 250 offices that are organizing all this! There is an attempt at sabotage and a shadow government made up of Obama embeds and Clinton embeds in the bureaucracy, and these Organizing for Action offices that are organizing all these protests with mass produced protest signs with fill-in-the-blank issues. And these people are paid. And they’re recruited. We know this because it’s been admitted to by the people that run these operations. What does that tell you was on NBC’s mind? That maybe they were gonna be able to get rid of him? And let me be generous. That maybe Trump was going to destroy his own presidency in record time. But right there it is. “This Presidents’ Day, as thousands prepare to swarm the streets for Not My President’s Day rallies –” by the way, who started those? Where did these Not My President’s Day rallies get started? Hello, Mr. Soros. Hello, Mr. Obama. Hello, Mrs. Clinton. As thousands swarm the streets for Not My President’s Day, the president will celebrate a milestone. He’s reached his 32nd day in office. That small victory means that despite the demands of his detractors, President Trump will not have the shortest term in the Oval Office. So they’ve been counting. They’re a little bit frustrated here, I’m sure. You can probably throw a “damn it” at the end of the headline. 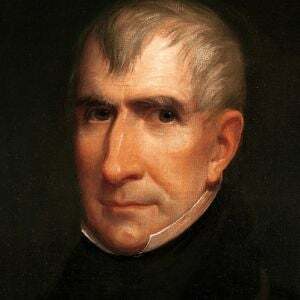 The honor of president serving the shortest term is William Henry Harrison, the ninth president, died from pneumonia just 32 days into his presidency on April 4th, 1841. He’s also the first president to die in office. Not only. First president. RUSH: You know, I said there was a small but expanding Stack in my show prep today of stories that indicate some of the pizzazz is beginning to wane, as it were, from the collective anti-Trump energy out there. And it is, and I’ve given you three examples so far today, and here’s the next. This is from our old buddies at Breitbart News, and the headline: “LGBT Anti-Trump Protest in D.C. Fizzles Bigly — Even on a beautiful day with temperatures in the high 60s, organizers could not muster a decent-sized protest turnout against President Donald Trump at an LGBT event on Sunday outside the Trump International Hotel, a few blocks from the White House. Can anybody tell me what has Donald Trump ever done to offend the lesbian, gay, bisexual, and transgender crowd? What has he ever done? I mean, it was Obama who came out and was originally anti-gay marriage and then when it became politically expedient, flipped. But what’s Trump ever done? What has Trump ever done to homosexuals, other than maybe take a swipe at Rosie O’Donnell. (interruption) That’s right. She took the swipe at him first. So I don’t know.